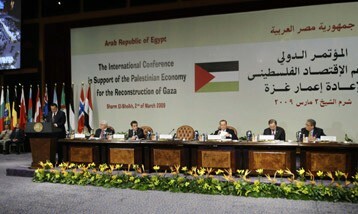 Was I the only one rubbing my eyes in disbelief yesterday, as the Egyptian government hosted an "International Conference in Support of the Palestinian Economy for the Reconstruction of Gaza"? Husni Mubarak of Egypt addresses the Gaza donors' conference. It took place in Sharm El-Sheikh, attended by delegations from 71 states, plus 16 regional, international, and financial organizations. Its stated goal was to raise US$2.8 billion, of which $1.3 was for rebuilding what had been destroyed in the course of Israel's recent war on Hamas (the rest would be sent to the Palestinian Authority to help improve its standing). The actual amount raised at the conference was $4.5 billion which, when added to previously committed funds, means the grand total for Gaza and the PA comes to $5.2 billion, to be disbursed over a two-year period. A delighted Egyptian foreign minister called the amount "beyond our expectations." U.S. Secretary of State Hillary Clinton called it "a very productive conference"
Among the larger donations included a Gulf Cooperation Council contribution of $1.65 billion over five years and a U.S. government pledge of $900 million from the American taxpayer (of which $300 million will go for Gaza rebuilding). Husni Mubarak of Egypt, Nicholas Sarkozy of France, Silvio Berlusconi of Italy, Ban Ki-moon of the United Nations, Amr Moussa of the Arab League, and Mahmoud Abbas of the Palestinian Authority gave speeches. Why my disbelief at this spectacle: I wonder if those eminentoes and worthies really believe that warfare in Gaza is a thing of the past, and that the time for reconstruction is nigh? They must not read dispatches from southern Israel, which report the daily warfare that continues there. Take a representative news item from Yedi'ot Aharonot, dated February 28, "Experts: Grads in Ashkelon were advanced." the two Grad rockets that landed in Ashkelon Saturday morning[, Feb. 28,] were new and improved models, capable of greater destruction than those usually fired from Gaza. One of the rockets hit a school in the southern city, and succeeded in penetrating the fortification used to protect it from projectiles. … The Grad rockets that hit Ashkelon were two of only five or six locally manufactured 170 mm rockets ever fired at Israel, experts say. The rarely used rockets have a range of 14 km (8.6 miles) and are capable of massive damage, evident from the destruction witnesses described on the scene of Saturday's attack. In an official protest to the United Nations, the Israel's Ambassador Gabriela Shalev noted that "there have been nearly 100 rocket and mortar attacks from the Gaza Strip" since the ceasefire on January 18, or over two per day. 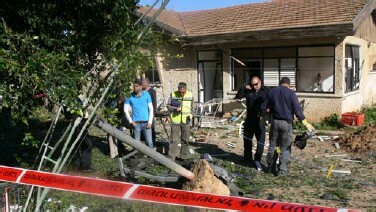 These have been increasing in number, with 12 rockets were fired at Sderot on March 1 alone. Responding to these attacks, the Israeli cabinet resolved on March 1 that "should the firing from the Gaza Strip continue, it would be met by a painful, sharp, strong and uncompromising response by the security forces." Prime Minister-designate Binyamin Netanyahu echoed this bellicosity, reportedly telling a European leader that he would not sacrifice Israel's security "for a smile." What the hell are the donor countries doing, getting in the middle of an on-going war with their high-profile supposed reconstruction effort? My best guess: this permits them subtly to signal Jerusalem that it better not attack Gaza again, because doing so will confront it with a lot of very angry donor governments – including, of course, the Obama administration. Adding to the surreal quality is a blithe disregard for Israel's security needs. Consider the attitude of Douglas Alexander, international development secretary for Britain's Labour government, who pledged £30 million of his taxpayers' funds to rebuild houses, schools, and hospitals in Gaza. "There is a desperate need for tough restrictions on the supply of goods to be relaxed," he said, demanding next that "Israel must do the right thing and allow much-needed goods to get through to those men, women and children who continue to suffer." That's very humanitarian of Mr. Alexander, but he willfully ignored Israeli expectations that Hamas will confiscate steel, concrete, and other imported construction materials to build more tunnels, bunkers, and rockets. After all, Hamas appropriated prior deliveries intended for civilians, and so blatantly that even the usually docile United Nations Relief and Works Agency protested. Husni Mubarak might warn Hamas not to treat the donors' pledges as a "conquest of war," but it will assuredly do precisely that. U.S. Rep. Mark Kirk (Republican of Illinois) got it right: "To route $900 million to this area, and let's say Hamas was only able to steal 10 percent of that, we would still become Hamas' second-largest funder after Iran." So, under the cheery banner of building, in Clinton's words, "a comprehensive peace between Israel and its Arab neighbors," donor states are not only defying Israel to protect itself from rocket fire but they are funneling matériel to Hamas. Is this ignorance or mendacity? I suspect the latter; no one is that dumb. Mar. 3, 2009 update: Barry Rubin makes a complementary argument at "What Price Gaza?" against the funds for reconstruction, noting that it will not win good will nor peace. And I did raise the topic here of sending money to the Palestinian Authority, which in the past has led to more terrorism out of its territories. See "Fund the Palestinians? Bad Idea" for details. Mar. 6, 2009 update: Good news - perhaps the March 2 meeting was all smoke and mirrors. See "Was the Gaza Reconstruction Conference a Fraud?" for reasons to think it was. Related Topics: Arab-Israel conflict & diplomacy, Palestinians, US policy | Daniel Pipes receive the latest by email: subscribe to the free mef mailing list This text may be reposted or forwarded so long as it is presented as an integral whole with complete and accurate information provided about its author, date, place of publication, and original URL.